In 1896, the millennium of the conquest of Hungary, a group of statues was raised in Budapest on Heroes Square. The central group of figures depicts Árpád and his chiefs. Behind them, in a semicircle, are many subsequent kings and rulers of Hungary. We see the most distinguished figures of communal memory here, but they all belong to the same type. Three of them are the most frequently cited and celebrated: Árpád, who found his people a home, Saint István, founder and first king of the state, and King Mátyás the just. Alongside the Virgin Mary, Hungary considers Saint István its other patron saint. There are many works of art which depict three saints of the House of Árpád, Saint István, Prince Imre and King László together, almost as a family. 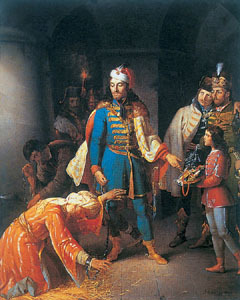 In the line of great military heroes of the Turkish wars János Hunyadi, the winner of a great victory at Nándorfehérvár, occupies first place. His son Mátyás is also a member of the national historical pantheon: many popular stories and legends, in which he mingles with the people of his country in disguise, surround his figure rendering him the embodiment of justice. His intellect was also legendary. In the eyes of his successors, in a country which had been torn to pieces and had lost its independence, Mátyas became the greatest example of a glorious national ruler. Two figures found their way into communal memory for their role in heroically defending two major fortifications against the Turkish troops: István Dobó, whose figure was immortalized by the writer Géza Gárdonyi in his novel Eclipse of the Crescent Moon, and Miklós Zrínyi, the hero of Sziget, who was referred to by his contemporaries as the “Hungarian Leonidas”. 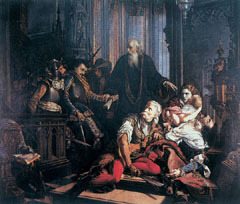 Ferenc Rákóczi II is without a doubt the most outstanding of all leaders of the 18th century struggle for independence. His noble figure and unselfish personality have rendered him the definitive representative of the tradition of independence. The nation remembered him with a spectacular reburial two hundred years after the Kuruc Wars. The fight for freedom in 1848-49 is the most important modern chapter of national mythology, a climax of one of the most magnificent eras of Hungarian history, despite its tragic ending. Figures of the first half of the 19th century who have become national symbols deserve their own memorial hall: István Széchenyi, the “greatest of all Hungarians”, Lajos Kossuth, leader of the fight for freedom, Lajos Batthyány, the prime minister who died a martyr’s death Ferenc Deák was also a member of their great generation, whose outstanding legal knowledge and political talent guaranteed him the title “sage of the homeland”, not lastly because of the Compromise of 1867. And of course if ever there was a “youngest prince” among the great figures of the Hungarian nation, with an unmatched gift and a career like a shooting star, then Sándor Petõfi, poet of the revolution, was he. He embodied the two fundamental features of the Hungarian national character: a talent for poetry and the desire for freedom. A cultural characteristic of Hungary, not a rare phenomenon in other countries of Central Europe, is that it is the poets and writers who define the nation’s vital questions. Their works convey most effectively what it means to be Hungarian, and what the most important values of the nation’s past are. Often critical and judgmental of the nation’s sins, they still accepted responsibility for the homeland, and by painting the darkest possible picture their purpose was to steel their contemporaries and the following generations against obstructions and malicious intent. Hungary’s greatest poets tried to steer their contemporaries towards moral and public renewal with poems full of self-remorse and resoluteness. clan fighting clan for creed or crazy greed. I suffer with the conquered in defeat. with gentle future – new Hungarians!